Use these Mirror Skin Weights Options from Rigging Dojo to improve your results. Maya skinning tools can be picky at times but as long as you don’t let it have to many choices, like a 2 year old child, then things can go very well. Here are our recommended settings to get good results 99% of the time. Make sure your Mirror across plane is set for your character and you are copying the correct direction. The Closest point on surface setting is the most accurate. The important part is the Influence Associations. For symmetric skeletons and models, you want the Maya to first look to to match left joints one to one, no guesses, just equal copy. The other important setting to get Maya to behave though is , Influence Association 2 – if Maya finds equal joints but they happen to be in the exact or near exact position (think stacked twist or more common face joints that are all stacked up, eye lids, mouth) you can use joint labeling to help Maya not get confused. You can set the attributes for the label as shown in here – set the side, set the type to Other and then, give it a name. Use the same name for both matching joints just switch the “side” attribute. With this new information you should have much better mirroring and less clean up work when it comes to your character skinning workflow. But there are times that you can’t work with ngSkinTools or you need to mirror weights on something like a curve as we show in the video above and knowing how to control the Maya weight tools will help you out. The issue with Maya’s mirror skinning tool is that is doesn’t handle at all vertices been painted from a side influence to the other side of the mesh. It just fails to get the center edge loop correctly and if you painted beyond the middle of the character then is even worst. Center line weights and cross weighting aren’t a problem in most cases when the mesh is truly symmetrical and the center-line is directly on the world zero and the mesh transform is zeroed. Check those things, make sure your influences are unlocked and make sure to use our settings and see if it works better for you. Thanks for the post. You mention not using post normalization and sticking to interactive. What is the argument against post normalizing? I find myself switching back and forth depending on how I want my weights to distribute as I paint. Ah, be careful that you are not confusing interactive and post with the setting for paint weight distribution of distance instead of neighbors. Post normalize is a hidden process that at playback forces the weights down to a 0-1 space, while allowing an additive weight approach that makes for very difficult management of weights with the existing tools in Maya, and was developed for using the capsules to weight with, not really painting weights. Keeping normalization on interactive means that Maya will always balance the weights between 0-1 while painting but you want to make sure the skin cluster is set to neighbors so that the balancing doesn’t spread weights out across the entire set of influences, instead only looking at the surrounding points and their influences to decide how to spread out the weights and keep a 0-1 balance. thanks for the info. I have a little problem, is there a way to mirror the weights for just one single joint? Same question as “jaime”: is there a way to mirror the weights for just one single joint? Yes, two ways, one lock all your influences except the two you want the weights to mirror. The other option is to select the influences verts and then mirror and it will only mirror the selection. Sure thing, glad it could help you and also sad that it hasn’t gotten any better since then. 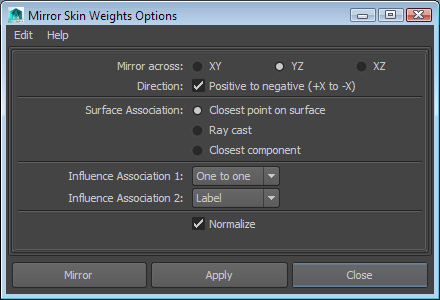 By the way do you know if there is a way to mirror only selected skin weights? Lets say I want to mirror only legs of the character, not the whole body side? never mind, just went through comments and found the answer. You are awesome, guys, keep on rolling!